Far-out Pathways to Space: Great Guns? A cannon of this type was actually built, named SHARP. HARP, stands for High Altitude Research Project, the name of an earlier "space cannon" project (see section #30a of "Stargazers"), and S stands for "Super." The SHARP gas cannon (pictured at the top of the website) was built by the Livermore weapons lab near San Francisco to study the flight of space vehicles and projectiles at up to 8-9 times the speed of sound. 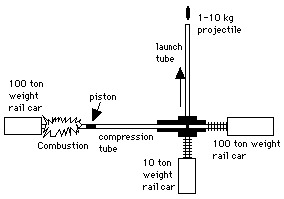 The explosion which pushes its piston comes not from gunpowder but from a mixture of methane and air, compressed to about 55 times the atmospheric pressure and then ignited. The piston weighs a ton, the main barrel is 155 feet (47 meters) long and the projectile emerges in a big flame of hydrogen, which burns up in the atmosphere. Plans also exist for accelerating a payload by magnetic forces on a "rail gun" consisting of parallel conductors, into which a very large electric current is directed. The same problems apply here, plus the added one of storing and then suddenly releasing a great amount of electrical energy. That technology might be appropriate for use on the Moon, in some distant future (as Arthur Clarke has suggested in one of his stories), but so far it has not been much developed. "Aviation Week" (p. 40, 27 August 2001) tells how a "light gas gun" similar to the one described above helps solve that problem. In this case it is a gun of the US Air Force, with a barrel length of 120 feet (36 meters) and a caliber of 4 inches (10 cm). A small model of a scramjet, loaded with high-pressure ethylene fuel, was fired from it at 7.1 times the speed of sound (Mach 7.1) and its performance was photographed in flight, before it crashed into a set of steel plates at the end of the lab. Thus a gas gun helps develop spaceflight hardware, even if it is not by itself a launch instrument.